Hey guys, Just a quick update. The project isn't dead, it's simply been worked on a slower pace than normal due to constraints out of my control. I apologize to everyone who is looking forward to this. Hey Axel, this project isn't canceled, it's simply been put on the slow track until I can dedicate more time to it. Currently it's a one-man project and until I can get it to a state where others can assist, it will stay that way. However, fear not, despite the the quiet appearance of the project, I am working little by little to finish the world and bring it out to you guys. One way or another, this project will see the light of day. It's just hard, I'm almost essentially tackling every aspect of creating an MMORPG by myself which is tedious to say the least; however, it will be rewarding for not just me but everyone when I can release it at it state I am satisfied with. I want to thank you for your interest and support. A little update. There has been a lot of work done behind the scenes which makes it appear as if this project doesn't progress. Luckily the site is mostly finished for the moment and I can resume WorldPainting so that I may upload the world and start building. If I am lucky, that will be by the end of the summer. Let's see how that pans out. FFIV:MC will allow players to roam the country side, allegiance to no kingdom! This change gives players the option of a nomadic lifestyle with some caveats, as choosing to live outside the confines of a kingdom means you relinquish a lot of perks that come with living in one. Without having to choose a kingdom, players who decide to travel will be focusing on territories for small-scale groups if not solo. Most vagrants will build upon a small parcel of land they can claim ANYWHERE, not just within their kingdom's borders. Anywhere with a few slight caveats, such as not being able to settle within around 150~ blocks of a capital city. The rules of the road are still being forged and this play-style, while still being developed, will give players the ultimate freedom of choice. Is there a King of Vagrants? Perhaps. 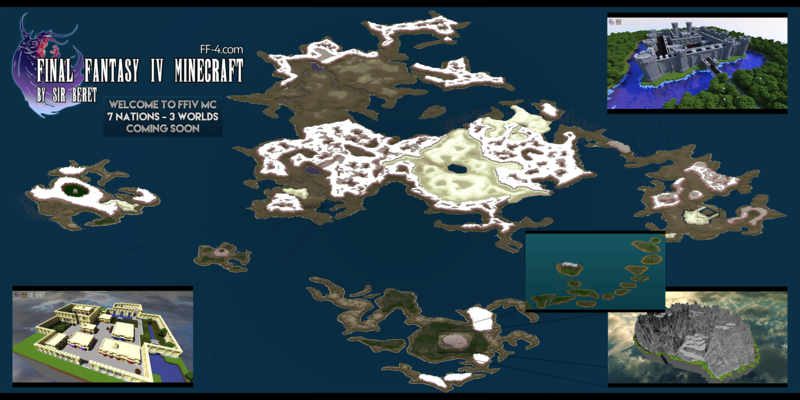 Welcome to Final Fantasy IV Minecraft. This forum is meant to help build a base so when the project releases into the public phase, there is a healthy population of players to interact with. I encourage everyone to register so that you can be notified of updates in the future! Thanks for reading so far. If you're interested in contributing to the project, please PM or email me by filling out the contact form on the About Us page. Click the button below to register on the site and post! So how many of you are real people? I've been trying to mitigate all the spam bot activity and keeping them from signing up but once they're in, you have to delete them one at a time. Will take a while. Need to bolster defenses. How's everyone else doing? This town is run by Beret.